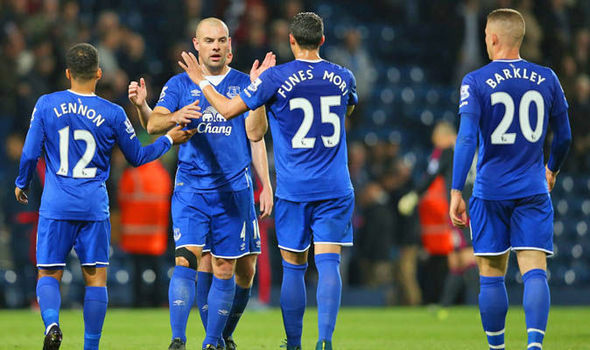 Everton beat Arsenal 2-1 to dent Arsene Wenger’s side’s title-hopes. Ashley Williams proved to be the unlikely hero for 10-man Everton as they handed Arsenal their second Premier League defeat of the season by securing a dramatic 2-1 victory at Goodison Park on Tuesday. Alexis Sanchez's 12th league goal of the season had given the visitors a 20th-minute lead, though his free-kick needed a deflection off the unfortunate Williams to find the net. Yet any ideas Arsene Wenger's men had of taking over from Chelsea at the top of the league disappeared when they conceded late on in each half to lose on their travels for the first time since March. Everton levelled just prior to the interval when full-backs Leighton Baines and Seamus Coleman conjured up an equaliser, the former's right-footed cross setting up the latter to head home from close range. Williams then popped up with a winner, although that was not the end of the drama. Phil Jagielka saw red in injury time after picking up a second booking, as the hosts just about held firm in a frantic finish.